Kathmandu (AFP) – Leading human rights groups on Friday accused Nepal’s new prime minister of attempting to intimidate officials from a national watchdog, after it criticised Kathmandu’s handling of recent violence-hit protests. In a joint statement, Amnesty International, Human Rights Watch and the International Commission of Jurists accused the government of failing to respect the independence of Nepal’s National Human Rights Commission (NHRC). Prime Minister K.P. Sharma Oli allegedly attacked watchdog officials over a submission they made to the United Nations Human Rights Council last month which called for a probe into claims that police used excessive force against protesters. “The PM’s blatant attempt to intimidate the NHRC members for that submission is a flagrant violation of the government’s basic obligation to ensure the NHRC’s ability to carry out its work independently and without undue interference,” said Nikhil Narayan, senior legal adviser to the ICJ. Nepal was gripped by a crippling months-long border blockade from September to February, sparked by a new constitution which the country’s Madhesi ethnic minority says leaves them politically marginalised. More than 50 people were killed in clashes between police and protesters before the blockade finally ended in February. Oli, who was elected in October, subjected commissioners to “aggressive questioning and reprimanding” after their UN submission, the groups said, calling on the government to end its “intimidation and harassment” of the watchdog. Gopal Khanal, the prime minister’s foreign affairs adviser, rejected the claims. 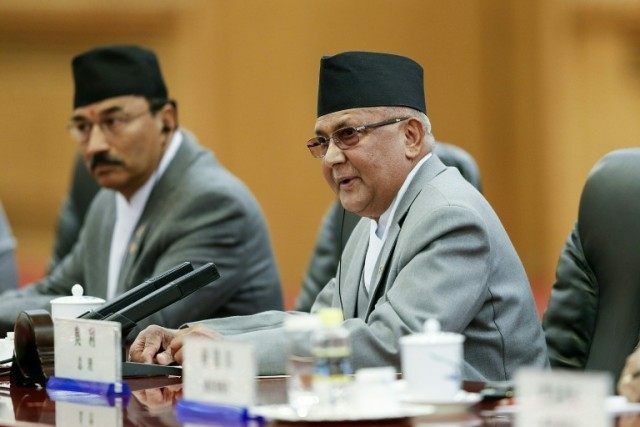 “The PM simply opined that it was important for the NHRC to act more cautiously at a time when different international actors are misinterpreting Nepal’s human rights situation,” he told AFP. As tensions continue to simmer, the International Crisis Group, an NGO which works on conflict prevention, warned of renewed unrest unless the government resolves the dispute over new state borders. Nepal’s Madhesis say the borders, laid out in the charter adopted in September, will limit their representation in parliament. The constitution, the first drawn up by elected representatives, was meant to cement peace and bolster Nepal’s transformation to a democratic republic after decades of political instability and a 10-year Maoist insurgency. But several rounds of talks between the government and the protesting parties have failed to reach an agreement.